In 2011, Eastern Kentucky University opened its doors and employed Dr. Mina Yazdani. For many of us, the path of education and securing a job is a daunting task with many obstacles being thrown in the way. But perhaps nobody in the Commonwealth of Kentucky has had to endure a more turbulent path than Yazdani. Born in Iran, Yazdani knew from an early age she wanted to study medicine and become a medical doctor. Her dream seemed to become a reality when she was admitted into the prestigious medical school at Pahlavi University, in her hometown of Shiraz. Things were going well until 1979 when the Islamic Revolution broke out in Iran and all universities went on strike. Shortly after the victory of the Revolution, the Medical School in Shiraz reopened allowing the students to continue their studies. After finishing her fourth year at medical school, the Islamic State had taken full control of the government. A “Cultural Revolution” had begun, and many people whose beliefs did not coincide with the government were purged from the university. Yazdani was and still is a member of the Bahá'í Faith, a religion that was born in 19th Century in Iran. Many of its followers have been persecuted since its emergence, and this has been particularly intensified since the 1979 Islamic revolution in Iran. As a result of her faith, Yazdani was prevented from continuing her education. Like many others in Iran, her dream of becoming a doctor was shattered. Thirsty for knowledge, members of the Bahá'í community established their own network of education in which Yazdani was an active participant. Although this network was not recognized by the government, it served to satisfy those who wanted to learn. This informal type of learning from the Bahá'í community has later been described by many as “constructive resilience” in the face of opposition. While serving as a mentor for younger Bahá’ís, she received her BGS through correspondence with Indiana University – Bloomington with a concentration in social and behavioral sciences. By 1998, during the administration of the reformist cleric Mohammad Khatami, members of the Bahá'í Faith finally were granted the opportunity of obtaining passports. Yazdani capitalized on this opportunity. She continued her thirst for knowledge and was awarded a scholarship to study spiritual psychology at Landegg International University in Wienacht, Switzerland. Upon completion, she returned to Iran, before being admitted into a master’s degree program in Religion and Culture at Wilfred Laurier University in Waterloo, Canada. Shortly after her graduation, a new opportunity arose for Yazdani at the University of Toronto, where she was admitted and awarded full funding for five years to receive her doctorate in Middle Eastern and Islamic Studies from the Department of Near and Middle Eastern Civilizations. Immediately after graduation, Yazdani was hired as an Assistant Professor in the History Department at EKU. While teaching, Yazdani continues to work on the historical roots of anti-Bahaism in Iran Women in the Middle East and frequently writes and publishes scholarly articles and book chapters on the subject. 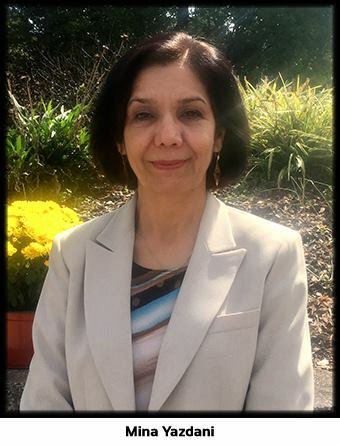 She is currently pursuing her research on the persecution of Bahá’í believers and its connection with Islamism.